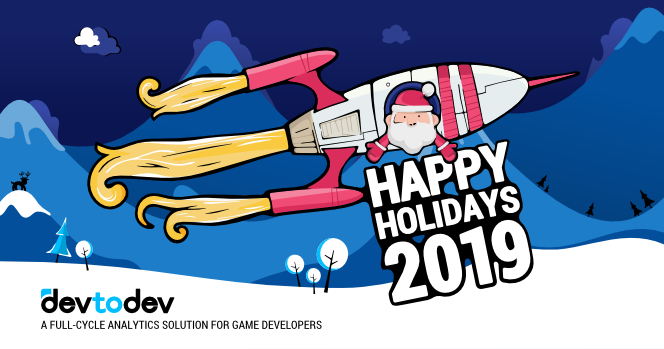 We’re in the middle of the winter holidays and now it’s time to share with you all the news and accomplishments that we at devtodev have had this year. 2018 has been quite a journey for us, and we can’t wrap our heads around how much we’ve done and how far we’ve come so far. There have been a lot of changes both within our company and within our system. First things first, we presented our new and improved devtodev in December. Soon, you’ll get tons of great features and will be able to enjoy our new interface and try new reports. And even now, you can switch to the demo that we’ll be gradually filling out with updated features. All the improvements were the result of our clients’ feedback and our wish to make your experience with devtodev even better. We’re changed devtodev’s interface completely and besides that, new devtodev will be filled with new reports, will contain new logic, and become more convenient and insightful. Also, you’ll be able to enjoy new game economy reports that will help determine all the possible monetization issues and start fixing them as soon as possible. And you’ll receive more flexible segmentation tools, e.g. creating a segment from the funnel step. You’ll see improved Retention graphs, User Flow report, Cohort Analysis, analysis of repeated payments, ABC/XYZ-analysis, forecasting, and many other cool features. Our team always strives to improve our clients’ experience and make it as smooth as possible, hence our move to the clustered data storage system. From now on, we’ll distribute data more evenly and you’ll be able to create queries and build reports faster. Education is trending and we at devtodev are happy to share our analytical insights and teach all the necessary gamedev skills. This year, we’ve launched a new online course for game designers and a course for game analysts. In 2019, we’ll be creating even more courses, writing articles and hosting webinars. Speaking about our company updates, we’re happy to present our new product: customer support outsourcing for game developers. Our support team works 24/7 and speaks 7 languages. Stay tuned in 2019 and find out how you can improve your games.